history – Literacy Changes Everything! Welcome to the first monthly installment of the Dines Family Book Club! My husband David and I often buy two copies of the same book, and we read them together and talk about them. Even through we are not part of a more formal book club, we enjoy having our book chats at home. I thought it would be perfect to share some of our selections with readers of this blog along with discussion questions. Enjoy! 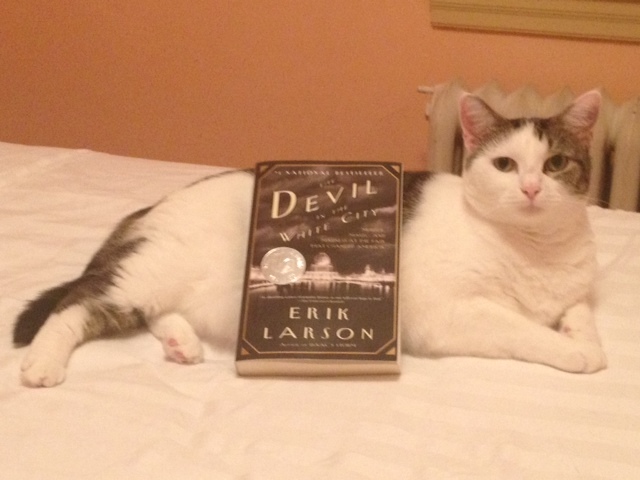 Pepper Dines elegantly displays the Dines Family Book Club’s September selection. A fantastic cocktail of American macabre beauty with a twist that “only Poe could have imagined”. A well-researched book that allows the reader to time travel through the dichotomy of good and evil in the White City and its dark shadow. 1. Why did Holmes feel the need to appeal to the public? 2. Why would parents allow their daughters to travel alone to Chicago? What social change made that possible? Was the crime rate in Chicago publicized? Would non-Chicago papers carry those stories? 3. Did Holmes’ victims have a particular psychological profile? 4. Who burned down Holmes’ building? 5. Why did people comply with Holmes’ wishes? 6. Could Holmes be the Devil? 7. Is it wrong to put human beings on display? 8. What is the danger in the desire to curate? How are Holmes and the fair’s planners curators? 9. How does the White City contrast the city of Chicago? 10. What are the connections between Holmes and the fair aside from physical proximity?